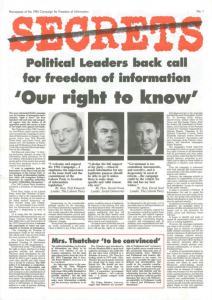 To mark the 25th anniversary of the Campaign (it was launched in January 1984), the Campaign has published back issues of its Secrets newspaper which appeared between 1984 and 1993. 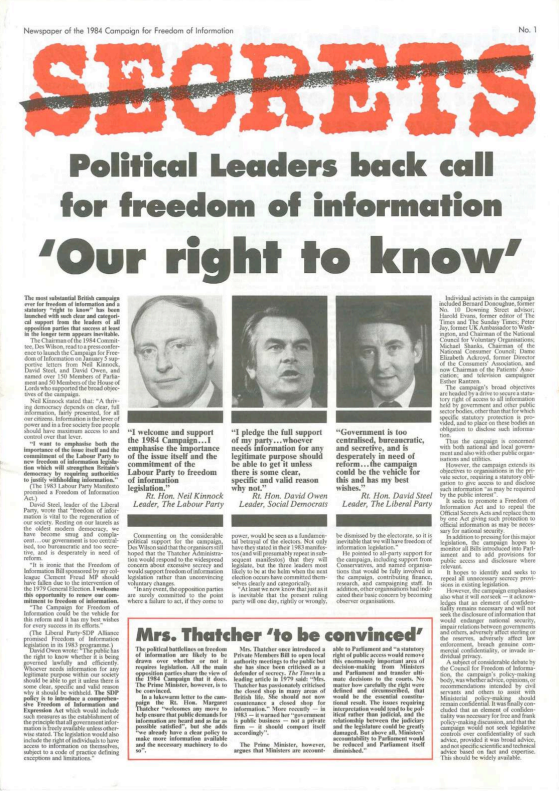 The newspapers, which may be of interest to people studying the history of freedom of information in the UK, start by describing the position of the party leaders at the time – Neil Kinnock, David Steel, David Owen and the then Prime Minister Margaret Thatcher. They document the secrecy problems that prompted demands for a FOI Act, the progress of various private members bills promoted by the Campaign, the causes celebre of the time including the Ponting and Tisdall official secrets prosecutions and the Freedom of Information Awards given to public authorities which voluntarily opened their files to the public without being forced to do so.